The Supreme Court has overturned the Central Election Committee's decision to disqualify MK Hanin Zoabi (Balad) from running for a Knesset seat in the upcoming elections. Sunday's ruling, rendered by a special panel of nine judges headed by Supreme Court President Asher Grunis, was unanimous. 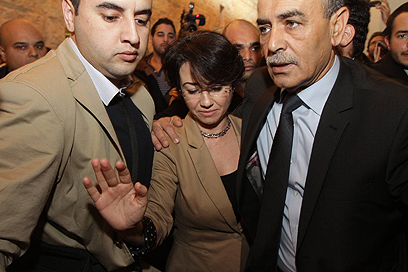 "The court's decision proves that the attempts to have me disqualified were the result of political and personal persecution against me, against my party and against the Arab public as a whole," Zoabi said in a statement released moments after the ruling. "The motions to have me disqualified were devoid of any legal merit. Still, this ruling does little to erase the threats, delegitimization and physical as well as verbal abuse that I have endured – in and outside the Knesset – over the past three years." The ruling, she added, "Proves that the Election Committee abused its authority. Balad and I will not be deterred by the delegitimization attempts made against us. "We won't allow anyone – in or outside of the Knesset – to decide the Arab public's position or limit our political aspirations. We will continue fighting against racism and the occupation and we will continue to dutifully represent the Arab public." Attorney Hassan Jabarin, head of Adalah – The Legal Center for Arab Minority Rights in Israel, who represented Zoabi, welcomed the decision: "All disqualification motions against Arab parties and Knesset members over the past 15 years had no legal merit and were meant only to delegitimize elected Arab officials. "Zoabi's case is different because there was also an attempt by the Right wing of the Knesset to portray her at a terrorist, despite the fact the she has never been charged of any crime. "We welcome the ruling, which above all shows that the Central Election Committee was wrong." The Likud-Beiteinu campaign issued a statement following the Supreme Court's decision, saying it was "regrettable." "We regret the Supreme Court's decision to allow MK Zoabi to vie for a Knesset seat. Given the court's interpretation of the law it is obvious that the law must change and clearly state that anyone supporting terror is automatically disqualified from being a Knesset member. "The Likud and Yisrael Beiteinu will use their next parliamentary term to amend the existing law." MK Ofir Akunis (Likud), who promoted the bid to disqualify Zoabi issued the following statement: "After two years of considerable efforts to have MK Zoabi disqualified – out of the deep belief that democracy has the right to defend itself against those who seek to destroy it from within – the court has spoken. "I deeply regret the Supreme Court's decision, but I respect it. I will continue to use the parliamentary tools at my disposal to protect and fortify Israel's democracy." MK Yuval Zellner (Kadima) echoed the sentiment: "I regret the Supreme Court's ruling regarding MK Zoabi. She systematically and actively acted against IDF soldiers and the values of the State of Israel. "Unfortunately, instead of focusing on promoting the legitimate needs of her constituents, Zoabi acted foolishly and compromised the fragile coexistence between Arabs and Jews." MK Danny Danon (Likud) stated that while he respected the court's decision, he found it "unacceptable." "Today, the court decided to back the Marmara's terrorist instead of the Navy Commandos, using Zoabi's parliamentary immunity as a shield. Zoabi belongs in prison." Danon stated that once the new Knesset is sworn in, he intends to promote a bill that would ensure that the Election Committee's right to disqualify lists whose members incite racism or negate the existence of Israel, is upheld. The Election Committee jurisdiction on the matter is detailed in Basic Law: The Knesset. "The 'Zoabi law' will be enacted and she can be sure that her days in the Knesset are numbered," Danon exclaimed. Fellow Likud MK Tzipi Hotovely lamented the decision, saying "The court has sent a message to the Arab MKs, saying that they can abuse their position, speak against the State of Israel and get away with it." Attorney Nidal Othman, of the Coalition against Racism, welcomed the decision: "The court proved today that it was a beacon of sanity in the midst of the racist atmosphere in Israel. "The Elections Committee's racist decision was overturned by the Supreme Court, which upheld its duty as the protector of elected officials. "The Elections Committee's racist decision made a mockery of the principles of democracy. It is only right that the power to disqualify (lists) is removed from its hands and placed with a legislative authority." MK Dov Khenin (Hadash) commented on the Supreme Court's decision to allow MK Zoabi to run for the Knesset, saying that the court "thwarted a takeover attempt by Netanyahu." "It's very disconcerting that the ruling party will stop at nothing, even compromise democracy, to gain a few more ballots." See all talkbacks "Supreme Court: MK Zoabi can run for Knesset "